Codi Frazier, the plucky 11-year-old who captured hearts across Salem-Keizer as she battled bone cancer, died early Tuesday at Doernbecher Children's Hospital in Portland. She was surrounded by relatives and her favorite nurse when she died at 12:52 a.m., according to Loni Barrett, the aunt Codi called Mama Loni. Our precious Codi on Earth is now our precious Angel Codi in Heaven, the family said on her web page. Barrett said codibug.com, which offers information about cancer resources, Codi's personal battle, and the community groups that helped her, will continue in her memory. Codi had been in and out of the hospital in recent weeks fighting off pneumonia and dealing with the effects of the cancer. Barrett said the family was able to bring her home for a few days last week. She wanted to see her rabbit and her cats, Barrett said. We knew she was declining, and she was in hospice care. When the family became concerned about managing her pain, they took her back to Doernbecher, where the staff was a great help, Barrett said. She was surrounded by people who loved her, she said. This week, relatives and friends recalled Codi as a child who dealt calmly with the challenge of her cancer, made friends easily, and charmed adults from community leaders to the governor of Oregon with her humor and bravery. She really was special, said Char Sachtjen, principal of Cummings Elementary, where Codi attended fourth grade. She was so radiant, and so inclusive. Codi was diagnosed with bone cancer in 1999 while she was living with her family in Las Vegas. Doctors amputated one leg and prescribed aggressive chemotherapy to halt the cancer. 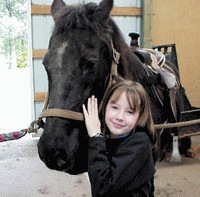 Her mother died in 2001 and Codi came to live with Barrett's family in Keizer, with her father moving to Oregon later. She quickly made friends at Cummings School, where her prosthetic leg didn't slow her down much. About a year ago, Codi was diagnosed with diabetes and received help from the Shriners Hospital in Portland. Insulin treatment helped restore her health, but a routine health screening last April determined that the cancer had returned. This time, the cancer was in her chest, affecting her heart and lungs. It was inoperable, and doctors said the she could have as little as two to three months to live. Codi subsequently was accepted for a trial of a relatively new drug aimed at stopping inoperable tumors, but the drug didn't help. In the meantime, Codi, with help from her family, launched a campaign to raise public awareness about Osteosarcoma and other cancers. They started her website and she appeared at various community events. She became a junior member of the Salem Kiwanis Club and was named an honorary member of the Keizer Rotary Club. Schreiner's Iris Gardens named a variety of iris for her, calling it Codi's Angel Face. Codi also was a grand marshal in the American Cancer Society's Relay for Life in Salem. In her quest to draw attention to cancer, she met with legislators and Gov. Ted Kulongoski, who took a personal interest in her situation. He even invited Codi to have her birthday party at the governor's mansion in July, and without publicity or photo ops, visited her several times at the hospital in Portland. The governor became a friend, and there was no politics involved in this, Barrett said. Barrett said support from the Salem-Keizer community and from Codi's school was a great help to the family. Several fund-raisers helped pay medical expenses, even to hire the services of a top Osteosarcoma specialist, and allowed the family to give Codi adventures and experiences to brighten her remaining days. The community was a huge factor in the good care that Codi received, Barrett said. We couldn't have provided the level of support without the people of this community. They are our heroes. In addition, the school's outpouring of support let Codi know how special she was. They became a part of our extended family, Barrett said of the staff and students. They embraced her, and made her feel like a normal kid in the school. Sachtjen said close friends at Cummings School recently created a poem and artwork for Codi that stressed the idea that everyone was welcome in Codi's circle. That sums it up, Sachtjen said of the message. The mood at school was quiet Tuesday, as friends coped with the news. Sachtjen brought in a school district crisis team to help students and staff deal with the loss. A substitute teacher was on hand to relieve teachers who might be especially affected by Codi's death, and counselors and teachers spent time helping students with their grief. The staff has been incredible, talking with the kids and taking care of them, Sachtjen said. She said she was glad that Codi's classmates, now in fifth grade, had been able to complete a video card for her just last week. Barrett said the video of her friends singing and waving was a welcome gift. When she saw the video, her eyes just lit up, she said. At press time, funeral arrangements are pending at Barrick Funeral Home in Salem. The service information was to be posted on the website, www.codibug.com, as soon as possible, Barrett said. Meantime, the family suggested that memorials be contributions to any of the non-profit organizations listed on the website. That's what Codi would want, Barrett said.